Training camp opens today for the Seattle Seahawks, and once again fans are invited to the Virginia Mason Athletic Center (VMAC) in Renton, Wash., to cheer on their favorite team as they get ready for the 2012 season. For those who are outside the area or deployed overseas, I hope to get some photos when I’m there next week. It’s the start of football season! An out-of-the-ordinary thing happened at the start of the Seahawks’ OTA session today: The practice was invaded. The players stopped and applauded as the soldiers from Joint Base Lewis-McChord made their way to the lake side of the fields. A group of Seahawks took some time to visit military personnel at Joint Base Lewis-McChord before beginning their off season workouts this week. As part of the Seahawks 12th Man Tour that connects Seahawks players with fans across the Pacific Northwest, Seahawks cornerback Roy Lewis and wide receiver Ricardo Lockette paid a surprise visit to Spokane native Chris Carver – an Iraq War veteran who spent two months in a coma after his humvee was hit by an IED. It was a much welcomed surprise for Carver, as Lewis and Lockette – players from Carver’s favorite team – presented him with a 12th Man flag, an autographed jersey, and four tickets to the Seahawks’ games against the New York Jets and New England Patriots. Carver had to teach himself how to walk and talk after suffering a traumatic brain injury as a result of the incident, which took place in 2007. For his service, Carver was given a Purple Heart – a military decoration awarded in the name of the President to individuals that have been wounded or killed in action. The Military Sea Hawkers joined the rest of the Sea Hawkers clubs in the Puget Sound area for a barbecue at the VMAC. The Seattle Sea Gals, official cheerleaders for the NFL’s Seattle Seahawks, performed for Sailors and Marines deployed aboard the amphibious assault ship USS Makin Island (LHD 8) Feb. 13 as the ship conducted operations in the U.S. 5th Fleet area of responsibility. The event, sponsored by Armed Forces Entertainment (AFE), also included an appearance by Seahawks defensive back Roy Lewis and a performance by comedian Bryan Ricci. After the show, the Sea Gals, Lewis and Ricci interacted with the crew and signed autographs. The troupe ate lunch with members of the crew and embarked 11th Marine Expeditionary Unit (MEU) who were from the Seattle area and are fans of the team. Finally, I wanted to offer one last chance for folks to help Angie Johnson, anthem singer for the Seahawks Military Appreciation Day game last year against the Baltimore Ravens. 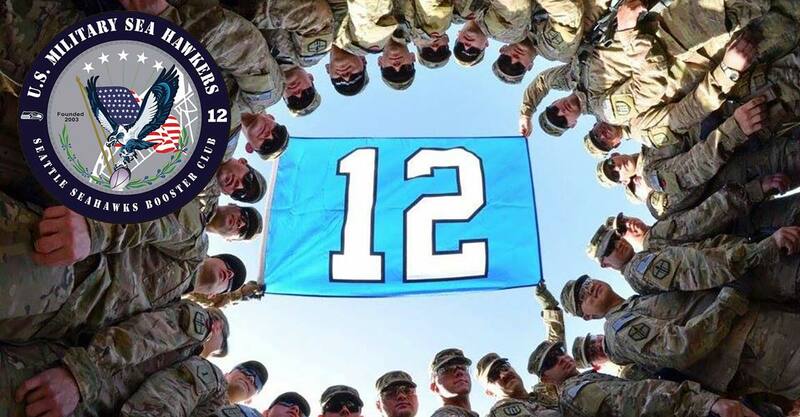 The Seahawks and Military Sea Hawkers have already combined to donate $300 to her campaign. The Seattle Seahawks will open 13 training camp practices at the Virginia Mason Athletic Center (VMAC) beginning Saturday, July 28th and concluding Wednesday, August 15th. I have my tickets for August 8th! Here’s to an outstanding 2012 season!